Introducing organicgirl, producers of great organic dark greens, our latest sponsor. We eat a lot of dark greens around here. A LOT. However, pies and cakes and cookies? They are truly treats around here. This year, we instituted a new rule around the house: we only have dessert on the days that start with S. (“Saturday and Sunday!” Lu will tell us all, immediately.) We’ve set the notion of “sometime foods” into solid rotation in our schedule. Most of the time? It’s vegetables. And my favorite vegetables are dark greens: kale, mustard greens, spinach, dark romaine leaves, chard, and microgreens when they’re in season. These days, about 50% of my diet seems to be dark leafy greens. I’m certainly not surprised to find that I feel good when I eat this way. Every day this summer, I’ve had a giant salad for breakfast or lunch. (Think Elaine’s big salad, really.) I have a template for it: a pile of dark greens, a pile of colorful vegetables, something crunchy, something soft, hopefully something fermented, some protein, and an interesting dressing. Today’s happened to be 4 different kind of greens, fermented carrots, pistachios and dehydrated coconut flakes, a bit of Parmesan, a fried egg, and lemon-tahini dressing. After the big salad, I feel strong and don’t need to eat for hours. We grow greens in the summer and we have farmers on Vashon we love. However, during the winter, I find that I need something other than cabbage to sustain me. And I know that most folks don’t have access to enough land to grow their own greens. This is why we’re such big fans of organicgirl, our latest sponsor. We love the greens offered by organicgirl. They’re delicious and already triple-cleaned. Unlike some of the greens in plastic clamshells I see in stores, the greens in the organicgirl packages are always crisp, not one leaf past its prime. I keep a container of the spinach greens in our refrigerator for my morning smoothies. These are good people. organicgirl is a good company. We’re very happy to share the work of this company with you. We’ll let them tell you more about themselves here. Why are you in the business of “good clean greens”? Quality rules at organicgirl. Day in and day out, we work hard to give you good clean greens that we’re super proud to put our names on! At organicgirl that means growing and selecting only the very best fresh, wholesome and tasty greens. We have very high quality standards throughout our growing, washing, drying and salad blending processes. We also believe that greens can be used in your daily diet in many ways, so we created unique blends that offer you versatility to cook, bake, juice & eat your greens. Why do you feel gluten-free folks need greens and vegetables in particular? We know gluten-free folks are very conscious about what they eat. At organicgirl, we are very conscious about our greens and salad blends. We have a group of salad blends, SUPERGREENS, SUPER SPINACH and I heart baby kale, that was specifically designed to maximize nutrition AND taste great without any compromise. These greens offer versatility of use to help incorporate greens into a healthy diet. Our philosophy is that anyone can be an organicgirl and we believe that good clean greens are a great addition to anyone’s lifestyle. Whether you’re a salad fanatic or you’re new to good clean greens, there truly is something for everyone at organicgirl. Can you tell us about the farmers you work with? And how you work with them on sustainability? We are partners with a handful of growers from various farms on the central coast of California and in the desert of Arizona. The growers we partner with share our same commitment to quality, follow the organic standards outlined by the USDA and organicgirl, and together we continually work to improve our quality farming practices. This hard work was highlighted last year when organicgirl received the highest rating of “BEST” from the Whole Foods Market Responsibly Grown program. Can you share a story from a customer that is particularly meaningful? This is a hard decision. I think my most meaningful interactions with organicgirl fans are either those where people are on a journey to health or wellness – fighting an illness or improving their health and they associate organicgirl with their success. (Of course, we are humbled to be part of that journey, and realize ultimately it is all them !) OR, it’s the fans who are 60+ years of age who write to us to tell us they are organicgirls too – always have been and still feel that way. organicgirls are age-less. I find both those interactions most meaningful and inspiring. 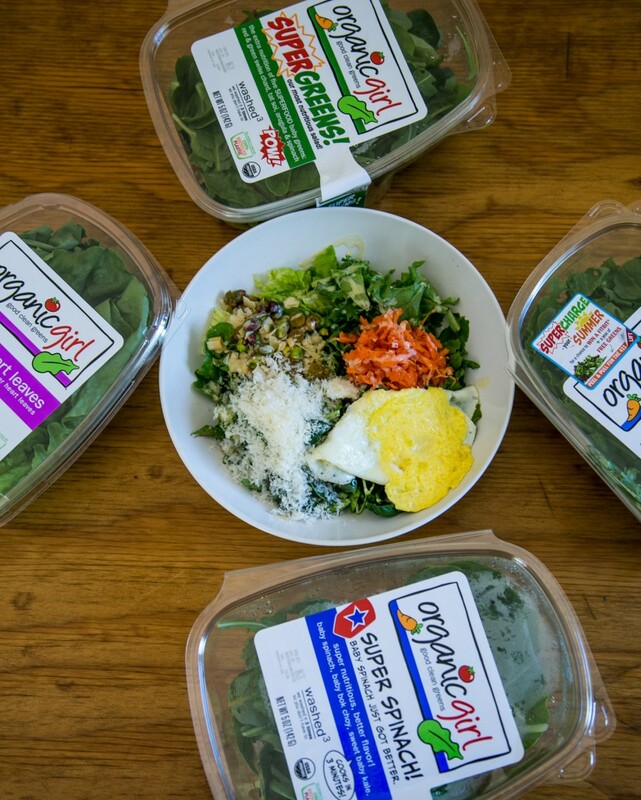 We hope you’ll notice organicgirl greens the next time you go to your grocery store. (And if you don’t see organicgirl greens, ask for them by name. Here’s a list of grocery stores carrying organicgirl right now.) These are an easy way to add food packed with nutrition into our lives. And we gluten-free folks can use all the help we can get with that. The women at organicgirl would like to give away a box of greens to three readers of gluten-free girl. Leave a comment on this post for a chance to win. Winners will be chosen at random on Friday, July 24th and notified by email. a clamshell with no wilty leaves would indeed be fabulous! I’m looking forward to finding your products in the Top Foods stores that are nearby. I’d love to try them all. And when Shauna likes a product, I know it’ll be good. I love leafy dark greens. Thanks for the giveaway! love organicgirl! I have a smoothie made from their Supergreens every morning! I agree, these are the best greens and actually the most affordable choice in my grocery store. Will have to check & see if they are in our stores! I wish healthy organic greens were more affordable. I grow my own because paying $4-$5 for them a pop at my market is simply too much. It makes me frustrated because my husband and I both work and our grocery bill is ridiculous, also feeding two teenage boys! Maybe my vent is misplaced but I would love to see some words about thrifty tips for eating GF and incorporating wonderful greens into your diet. Sadly, organic produce is often prohibitively expensive for working class families. These look super! great article. My husband and I are green junkies! Looks like I can find them in s local grocery store – yippee! Can’t wait to try in my morning smoothie. I’m an organic girl too! Love their greens. Thanks for the giveaway, organicgirl! I’m heading over to King Kullen on my way to see my new grandson and I’m going to pick up some of your salads. Winning would be cool, too. I have noticed a marked difference with organicgirl leafy greens. The joy of eating a tender leaf of baby swiss chard! Rejoice. I’ve really am into smoothies lately. This would be helpful to just take a handful of greens and dump into the blender. I have not been able to eat enough greens! I have been on a kale kick lately. Last nights dinner was zucchini noodle stir fry with carrots and lots of kale. I would love to have another box of greens to play with! I’m hoping to find this brand locally! Love my greens! I buy your greens here in Portland, OR. Great sauteed with garlic and served with Rancho Gordo beans and calrose rice. I also blend your greens into smoothies. Thanks for your reliable and organic and consistently fresh product. And I can recycle the clamshell @ my local New Seasons Market. I would love to try these greens. I have been using another brand and it will be fun to compare. Organicgirl is a staple in our house (at least when we don’t have a bunch of monstrous kale in the garden in desperate need of being earn down) and a box of greens would bring some much needed variety to our diet. Yay! I put in a postal code instead of a zip code and it worked for Canada. I thought that brand looked familiar–it’s in my closest grocery store! I HATE to wash greens. Messy. They never dry well (even with a salad spinner). And time consuming. So, I LOVE pre-washed greens, especially organic ones. Arugula on my pizza. Kale sauteed with garlic and raisins. Romaine made into a salad. Yep. They have a great selection of products. There are four stores in my area that sell their products. I love spinach and like mixed salad greens. So happy to expand my list of favorites. I am already a fan of Organicgirl. This is a product I enjoy regularly. Good stuff! Nice giveaway! I’d love the chance to try some salad mixes — they sound delicious! I actually had a huge Salad with OrganicGirl greens with dinner tonight! Mmm, now I got a hankerin’ for a big, healthy salad! Looks and sounds like a great product, thanks for the chance to try it out! Enjoyed the interview too! At this precise moment, I don’t need more greens! Our CSA has my fridge packed with lettuce, collards, chard, bok choi, etc. But when that goes, boy will I miss it! I’d love to try these. I love OrganicGirl!!! I have used their beautiful greens for years and I would always love a free box. I have never seen this brand- would love to try it! What a great giveaway! My DH says I’d put greens in every dish we make, if it stood still long enough. He’s exaggerating a little , of course, but not by much, LOL! I love the name of your product. Thanks for offering a great product for those days when time is of the essence. I love their premise and the chance to try their greens! We love organicgirl greens. Every week we purchase kale, baby spinach, and many containers of mixed salad greens. A great shortcut for our daily lunch salads. We saute the baby spinach for a dinner side. We’ve been enjoying Organic Girl products from Natural Grocers & Whole Foods for a while now. I love baby kale and the Baby Arugula are favorites! Oh! And the Super Spinach makes it on my very picky son’s turkey sandwich everyday? we need to plug that fantastic lemon dressing here too! I gift that to family & friends! Delicious!